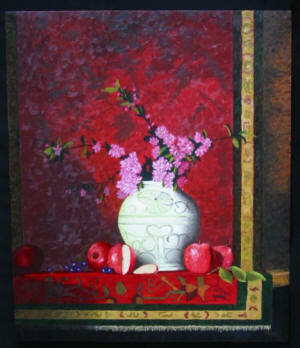 Donn’s most recent paintings are in this gallery. 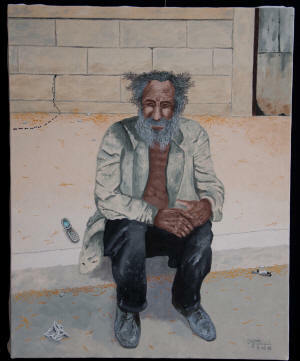 Every 50 steps down a sidewalk, street or road, a homeless person is at another address. They have a million addresses and will be at one when you call. 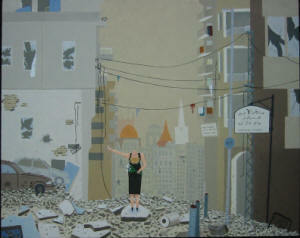 This painting was juried into Audubon Artists, Inc. 2012, an online New York exhibition. This was painted from my 1987 photograph taken before Zagreb's country's name changed from Yugoslavia to Croatia. This is Donn's contemporary rendering of the Bible verse in Deuteronomy 11:26-28. The woman represents both men and women of all faiths as suggested by a variety of worship buildings in the horizon. Faith has an opaque finger on her left hand; it indicates that despite our best intentions, we sometimes choose to make the wrong decision. Created with a free will, God allows us to make choices which result in either a blessing or a curse. Faith stands among the aftermath of a curse with the promised and missed blessing being hidden behind her back but visible to the viewer. What will we choose next time? This is my first still life painting. After the painting was well underway, I got excited about the challenge this painting presented when I finally chose the title. Then the challenge was “to have a hidden key or not?” Either choice would work! I do have a key hidden that can only be found when you are viewing the real painting. 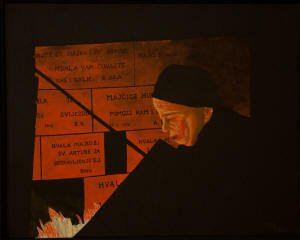 As usual, I always fall in love with my paintings when they are finished. Giving them up is difficult but starting a new painting helps soothe my soul so I can move forward again.